This section covers the roads and tracks of Ayrshire from prehistoric times up to the present. The first settlers moved into Ayrshire some 8000 years ago in the mesolithic period. Evidence of where they lived and hunted helps us to identify the routes they may have used. The same applies to the suceeding Neolithic, Bronze Age and Celtic peoples. 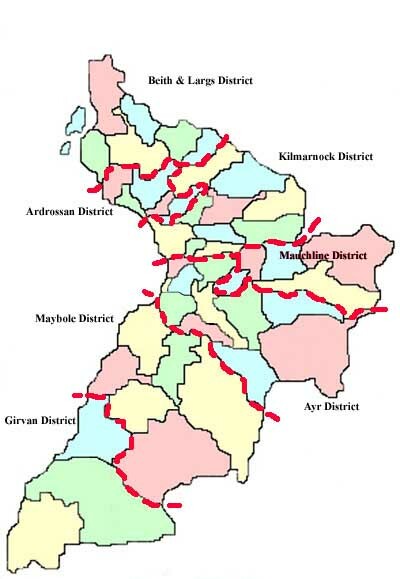 Although numerous roads have been proposed for Ayrshire only two have been proved. This section provides the background to the Roman invasion of Ayrshire and an overview of the literature. A strange mythic period echoing with the mead-drunken battles of Celtic warriors as they fought with invading Saxons, Picts and Scots over the obscure lands of Aeron. Although no roads were built in this period the routes reflect the invasion routes of the time. David I laid the foundations of modern Scotland by introducing features of Norman feudalism to Scotland. He founded new towns, created shires, and granted lands to his followers and to the Church. All of these contributed to the growth of a greatly expanded road network. From the 1600's onwards there was a gradual recognition of the need for improved roads. This is reflected in the legislation of the time, particularly the Statute Labour system that required people to work for six days without pay and in the work of the Commissioners of Supply who were responsible for bridges. Although our knowledge of Ayrshire roads in the post-mediaeval period is poor, there is a compensation at the end of the period in the maps of the Military Survey of Scotland, c.1750, which depict all the roads and tracks in the county. Turnpike roads were an essential part of the agricultural and industrial revolutions that brought so many changes to Scotland. This section looks at how the turnpikes were administered in Ayrshire. The two main Acts for Ayshire were passed in 1767 and 1774, allowing Trusts to be set up and road building to commence. This section looks at each of these, and later Acts, and attempts to identify the roads listed in the Acts. In addition to the large number of turnpike roads being built, each parish had responsibility for building and maintaining local roads. Details of each parish are given based on the Statistical Accounts of Scotland and other sources. Life on the roads was very different to what it is now. This section takes at look at the stagecoaches that ran on Ayrshire's roads and at the other types of traffic that would have been encountered. In 1859, the Commission for Inquiring into the State of Public Roads in Scotland carried out a comprehensive review of roads to see how best the roads could be funded and managed. The report gives us a detailed picture of roads in Ayrshire at that time and what people thought was wrong with the turnpike system. Apart from a growing reform movement, competition from the railways led to a gradual decline in the turnpike system with loss of revenue and inability to maintain the roads. In 1883 the turnpike trusts were disbanded and the roads made the responsibility of the newly formed County Council under the County Road Board. In 1929, a reorganisation of local government in Scotland resulted in changes to the way the roads were administered. This section details these changes and the work of the Highways Committee. It also details new roads that were built in this period and others that fell out of use. This section provides an overview of the changes from the formation of Strathclyde Region in 1974 to the present North, South and East Ayrshire Councils that were established in 1996.